Now, versatile multifunction print capabilities that used to be exclusive to large copiers are available in a compact size. Users of the Muratec MFX-2570 can scan color documents that are collected at resolutions up to 600 x 600 DPI (dots per inch), keeping your images, graphics, and text vibrant and sharp. Even with this great attention to detail, users can quickly move through large scanning tasks at an amazing 62 ppm (pages per minute). DirectScan functions let users scan documents directly into PC folders without having to install additional software. Also, documents can be scanned to any of the 2,000 email addresses that can be stored within this MFP’s dependable hard drive. For further ease, users can scan to a USB drive, taking information and ideas with them on the go. The new Muratec MFX-2570 from Pacific Office Automation features inventive document management solutions such as single pass duplex color scanning, direct USB printing, shift-sort document output, embedded document indexing, and more—all of which can be accessed by a touch screen interface that will dramatically reduce operator learning curves. With printing functionality, this model is anything but average. Single-sided documents output at a speed of 25 ppm (pages per minute) and 7 ppm with duplexing. A 50 sheet multipurpose bypass tray allows users to print on uncommon forms of media including envelopes, stationary, labels, and transparencies. 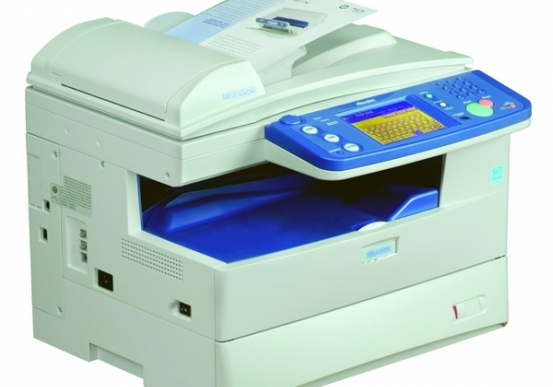 As a fax machine, the Muratec MFX-2570 provides users with a whole host of unique abilities that allow them to reorganize communication and distribute documents simply and effortlessly. There’s no better way to satisfy all of your document management needs with one powerful machine. - Scan color documents at up to 600 x 600 dpi. Scan two-sided documents at up to 62 images-per-minute. -Integrated address book can store up to 2,000 contacts, each containing a fax number, e-mail address and group locations. Mixed broadcasting (fax/e-mail) is supported. - Scan documents directly to a USB flash drive. -Optional PCL5e / 6, PostScript3, Direct PDF and XPS. -Optional barcode printing system (supports UPC/EAN, Interleave 25, Code 39, Code 126, PostNet and more). -Store commonly produced documents, such as forms, into the MFX-2570 memory and print them on-demand. -Print documents stored on USB flash drives. -Legal-size platen glass captures multipart forms, carbon papers, plastic identification cards and more. -Card copy mode allows for the seamless copying of two-sided driver’s licenses and/or insurance cards. -6 second first-copy-out-time (FCOT) and 20 second warm-up time. -Route inbound fax documents to another fax location, e-mail address or PC folder. Multiple fax forwarding locations can be registered based on specific numbers, area codes, etc. -The e-mail gateway feature enables users to send documents from the MFX-2570 through a network fax server. The operation is transparent to the user by using the same fax interface that is used for sending a traditional fax. -Send documents directly from PC applications using the simple PC fax driver. -System administrators can automatically archive all inbound and outbound communications, including both fax and e-mail, to create an audit trail of usage. - Shift-sorting physically separates each set in a print/copy job to create a distribution-ready stack of documents. Cassette Paper Weight 20 - 28 lb. Bypass Paper Weight 20 - 28 lb. Dimensions (H x W x D) 17.56" x 20.47" x 19.92" / 52.69 lbs. Dimensions (H x W x D) 18.62" x 20.47" x 19.92" / 57.98 lbs.